A recently described genus of octocorals with an aragonite skeleton, Nanipora, was discovered in a shallow seagrass meadow near Dongsha Island, Dongsha Atoll in the South China Sea. Nanipora has not been reported in this type of habitat before nor in such high densities; a total of 324 colonies were counted within 36 transects (25 m2). Additionally, these colonies were found to grow as independent rounded hollow mounds, next to their more usual growth form encrusting other substrates. These Nanipora colonies are the most dominant calcifying benthos in the seagrass meadow and indicate that the seagrass habitat found around Dongsha Island is a unique and important ecosystem that may harbor more undescribed diversity. The aragonite skeleton-forming octocoral family Lithotelestidae was known until 2015 from a few specimens of two fossils and three extant species from the Caribbean Sea and Indian Ocean. As an obscure member of the Order Heliporacea Bock, 1938, species in this family are considered as ‘living fossils’. The most recent group described was the monotypic genus Nanipora from Okinawa and unlike other Lithotelestidae reported until now, N. kamurai was found to inhabit shallow coral reefs. However, a further assessment of the type locality demonstrated that colonies were very rare (n=8 over 2400 m2), and only found on the undersides or shaded areas of coral rubble and rocks. To date, there have been no other reports of Nanipora from southern Japan. Subsequently, a second and much larger Nanipora population was discovered in the coral reefs of Koh Tao, Thailand, in the Gulf of Thailand. Unlike in Okinawa, the Nanipora colonies were zooxanthellate, and in deeper waters (5.5–11 m), and were identified as N. cf. kamurai. The number of colonies (n=143) and density (up to 20% cover in small areas) were also much greater than had been reported from Okinawa. Still, despite anecdotal reports of additional Nanipora in other locations in the central Indo-Pacific such as Indonesia (C. McFadden, pers. comm. ), it remains almost completely unstudied and is assumed to be rare, with a confirmed global living colony count of <200, although this is almost a product of the lack of data on this genus. In winter 2017, during surveys at Dongsha Atoll in the northern South China Sea (Suppl. Fig. 1), large numbers of Nanipora were noticed in shallow seagrass meadows around Dongsha Island. Here, we report on the unusual finding of numerous Nanipora within seagrass beds at Dongsha Atoll in the South China Sea, on our surveys documenting colony numbers and coverage, and discuss the importance of this finding in context of diversity and conservation in the South China Sea. Nanipora colonies were found between 100 to 300 m from shore, and only in one location around the atoll, as surveys in other areas including seagrass beds on the northeast and the entire southern side of the island, as well as from shallow coral gardens and flats inside the lagoon of Dongsha Atoll in both 2016 and 2017 did not find any additional colonies. Only two colonies were observed in shallower areas immediately inshore from the ‘Nanipora zone’ (n=10 quadrats), and depths in this shallow area were -0.7 to -1.0 m (relative to mean sea level). This shallow zone featured thick and comparatively tall seagrass beds of Thalassia hemprichii and little sand or other substrate was visible, as it was covered with roots, dead seagrass, and red algae, as well as occasional sponges and photosymbiotic ascidians (Didemnum molle). Similarly, at depths of -1.0 to -1.4 m immediately offshore from the ‘Nanipora zone’, no colonies were observed (n=6 quadrats). These seagrass beds, although lacking large amounts of dead seagrass and visible roots, were very dense, and again very little visible substrate was observed. This area consisted of T. hemprichii and Cymodocea serrulata seagrass. In the ‘Nanipora zone’, depths were -0.9 to -1.2 m. T. hemprichii seagrass was shorter and less dense, and fine white coral sand was easily visible between seagrass stems. Syringodium isoetifolium seagrass was also present in low numbers. Occasionally, Porites scleractinian corals (n=1 within quadrats) were also present, and no cyanobacterial mats were present on sand. This ‘Nanipora zone’ extended east-west for at least 300 m, and north-south for the same distance. In the interest of conservation (see also below), we do not present detailed latitude and longitude information here; it is available upon request from the corresponding author. Within the ‘Nanipora zone’, the average number of colonies per transect was 16.1±22.5 (=23.2 colonies/m2, n=20 quadrats), and colony distribution was observed to be very patchy, with up to 103 colonies in the most numerous quadrat (Table S1), and the five least numerous quadrats only containing one, two, three, three, and four Nanipora colonies, respectively. In the most numerous quadrat, Nanipora coverage was estimated as 32.9%, with smaller areas of up to 51.5% coverage within this quadrat (Table S1). Coverage in least numerous quadrats was <1.0%. Nanipora colonies were observed to more often be unattached to any other organism and formed rounded mounds semi-buried in sand between seagrass stems (Fig. 1D, E). These colonies were no greater than 15 cm in their largest axis, and generally approximately 5 cm. Upon examination, these rounded colonies were seen to be hollow inside (Fig. 1I). Less commonly, Nanipora colonies were observed encrusting upon other organisms, including the seagrass T. hemprichii stem bases (Fig. 1G), sponges and dead scleractinian corals (Fig. 1F, H). In the case of encrusting upon dead scleractinians, the Nanipora colonies were observed to grow larger than 15 cm. Portions of Nanipora colonies buried under the sand occasionally had open polyps extend above the sand surface (Fig. 1D); in such cases, the Nanipora skeleton was white in color even if the polyps appeared translucent brown. In cases where the skeleton was not buried in sand, it was also pale brown in appearance like polyps (Fig. 1E). The population of Nanipora at Dongsha Atoll represents by far the largest recorded population of this relatively unknown genus to date. In previous surveys covering 300 m2 (Thailand) and 2400 m2 (Okinawa), less than 160 colonies were counted, while in our 20 quadrats (13.9 m2) within the ‘Nanipora zone’, we observed 322 colonies. In Thailand, coverage in patches reached up to 20%, while at Dongsha coverage can exceed 50% in patches. From our surveys, Nanipora at Dongsha Atoll was found in a very specific habitat, T. hemprichii seagrass beds at depths of -0.9 to -1.2 m in which there is clean white sand clearly visible between seagrass stems. The N. cf. kamurai we found was zooxanthellate, similar to as reported from Koh Tao, Thailand, and it may be that this specific environment at Dongsha provides the colonies with just the correct amount of photosynthetically active light and protection, but further studies will be needed to verify this theory. In this environment, while we observed greater than 300 colonies of Nanipora, we only found one small Porites colony, and thus the octocoral constitutes the dominant calcifying benthic species in this seagrass meadow (Fig. 1A), along with foraminifers. Additionally, while reported only encrusting N. kamurai from Okinawa, reported on occasional laminar growth of N. cf. kamurai. Here, we report of an even more unusual growth form, circular hollow ‘balls’ that are semi-embedded in the sand of the seagrass meadow. Although not firmly attached to any substrate, these balls are stable and embedded in a network of seagrass roots, sponges, and other Nanipora colonies. The colonies, as one of the dominant benthos, obviously must play an important role in the ecosystem, and were seen during our survey to harbor numerous motile benthic organisms such as hermit crabs, starfish, and molluscs. The presence of this Nanipora population in seagrass beds was unexpected, given that all reports until now were from coral reefs. However, it is clear from recent reports that the seagrass beds and reefs surrounding Dongsha Atoll harbor undescribed diversity, and thus ‘unexpected’ findings such as in the current study can be expected from this region in the future. The ecology of Nanipora remains to be investigated, and future studies should ,therefore, examine not only coral reefs, but also seagrass beds. Similar to coral reefs, seagrass beds play an important part in marine ecosystems as larval nurseries and fish meadows and as carbon sinks, yet are often under anthropogenic threats including habitat loss from land reclamation and dredging. The remoteness of Dongsha Atoll offers some protection to the seagrass meadows surrounding Dongsha Island, but until further reports from other regions are published or confirmed, protection of the large Dongsha population is prudent due to intensive illegal fishing in surrounding waters by fishing vessels based in mainland China despite being a marine protected area. Additionally, understanding the ecology of Nanipora at Dongsha should be performed as soon as possible, given the recent dramatic loss of seagrass beds and the possibility of the loss of as-of-yet unreported additional Nanipora zones. Finally, this study can serve as an example of the urgent need for more marine biodiversity research in the South China Sea. Due to geopolitical disagreements, much of the region is off-limits to many researchers, and in such situations, ecological and diversity surveys are often deemed of lower priority compared to extractive industry exploration. However, it is clear Dongsha Atoll, and by extension, the South China Sea, harbors undiscovered marine biodiversity and bioresources, and actions to protect these for future generations need to be taken now. Basic ecological and diversity/collection surveys by trained experts are the first logical step in understanding what needs to be protected and what stands be lost in this understudied region. Nanipora cf. kamurai, previously reported as a rare, living fossil octocoral, is the dominant calcifying benthos in a large area of seagrass in the shallow waters of Dongsha Atoll. The presence of Nanipora at Dongsha Atoll was only confirmed once, in winter 2017, and thus it may be possible the abundance is ephemeral in nature; long-term observations would clarify the overall trends for this population. Although other areas of the atoll were investigated and no Nanipora noted, the species may be present in other areas of the atoll and not yet simply found. Additionally, other areas of the South China Sea lack investigation as well, and we do not know if the seagrass-Nanipora habitat observed here is rare or common. 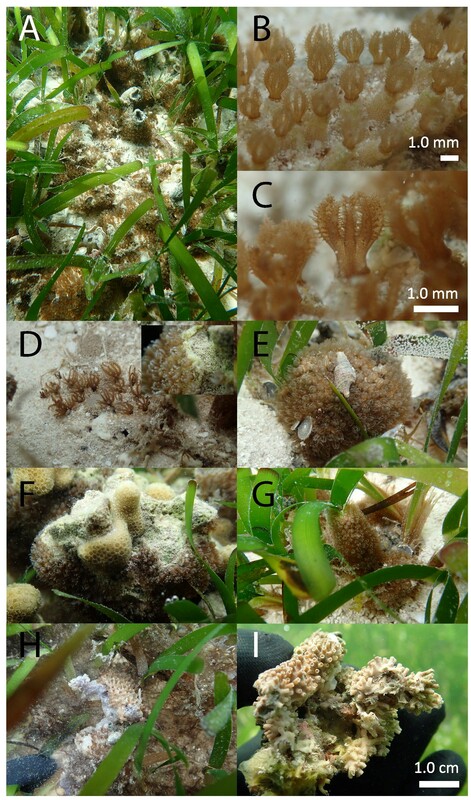 The discovery of this large population at Dongsha may indicate that Nanipora is not a rare species at all in the South China Sea, and instead has just been overlooked until now, due to its small size and somewhat cryptic appearance and habitat, either under rocks, at the bases of corals, or at the base of seagrass beds (this study). We aim to investigate other regions of the South China Sea to confirm this hypothesis. Additionally, the high numbers of Nanipora at Dongsha Atoll bear further examination, including detailed investigation of their physiology, Symbiodinium, and reproductive/life cycles. During snorkeling surveys on November 28, 2017 large numbers of a calcifying octocoral were noticed in very shallow seagrass beds around Dongsha Island (20° 43’ N, 116° 42’ E) (Fig. 1A). Subsequently, between November 30, and December 4, 2017; we surveyed the same area and other sea grass areas around Dongsha Island by snorkeling and manta tow. It was initially noticed that the octocorals appeared to be limited to very specific depths, and thus during our surveys we randomly placed rectangular quadrats (77×89 cm; =0.6952 m2) in both shallower (n=10) and deeper (n=6) areas adjacent to the ‘octocoral’ zone. We also placed quadrats within the ‘octocoral zone’ (n=20). For all quadrats, we counted the number of individual octocoral colonies (and of other anthozoans when present), and took images with an underwater camera (Olympus TG-3). For the quadrats with the highest number of colonies, we assessed the percentage cover of the octocoral colonies with ImageJ. Additionally, during surveys, we noted the shapes and sizes of colonies, as well as the substrates that colonies were found upon. We also noted what other species were present in the immediate vicinity (seagrasses, foraminifers, ascidians, sponges) of the colonies. The colonies were identified as Nanipora cf. kamurai based on specimens similarity with those found from the two previously recorded locations, at Hin Wong Bay, Koh Tao, in the Gulf of Thailand, and off Zamami Island, Okinawa, Japan. Colonies were seen to clearly be octocorals by their eight pinnate tentacles (Fig. 1B, C), and formed a hard skeleton with calyces identical to those of Nanipora (Fig. 1B). Specimens were zooxanthellate, and therefore were identified as Nanipora cf. kamurai, as in. The first three authors received funding from a Research Award Application for Dongsha Atoll Research Station (DARS)–2017–2018 entitled “Zoantharian (Cnidaria: Anthozoa) ecology in Dongsha Atoll: trophic niches and diversity patterns across micro-environmental scales”. The senior author was also supported by a JSPS grant number 16H04834 Kiban B grant entitled “Global evolution of Brachycnemina and their Symbiodinium”. We would like to thank the DARS staff: Arthur Chang, Ming-Hong Chen, Oskar Hwang and Jia-Kun Chen, and the Marine Park staff for their help in fieldwork and logistics.